Presented by Dr Michael Irwin (Author of Educating Boys) PhD, MEd Admin. 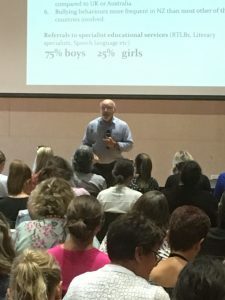 Dr Irwin challenged us to look at the way we engage with our boys and think about how our class environment and programmes could be adapted to be more ‘boy friendly.’ He acknowledged that some boys take up a large ‘space’ in the classroom with their noise, movement and energy. He gave a number of strategies to ‘hook’ in our reluctant writers. Many of the ideas were not new but hearing them delivered by someone with over 30 years experience in primary education, and 16 years researching how to best educate boys, gave them more clout. The importance of allowing boys to draw first before writing was mentioned, as was providing opportunities for boys to create their own cartoons or to provide graphics to go with their written work. Michael also promotes the use of buddy writing and ‘talk’ during writing time. He looked at how our young writers become story-tellers when they are given frequent opportunities to stand and read their writing out loud to their peers. He reminded us how important feedback is to our writers especially when a student uses the ‘million dollar’ vocabulary or phrasing. It was refreshing hear that we need to give boys permission to write about stuff boys are interested in: blood and gore; guns and war; toilet humour; monsters and goblins; cars and crashes; the list goes on… if it’s what adults call ‘inappropriate’ then chances are it’s what our reluctant writers want to be writing about. Dr Irwin isn’t a fan of teaching writing genre. He believes the more choice the better. Get the children writing first, and then worry about the other stuff- and I have to agree!